I joke that we often cook as if we are feeding an army. We both love serving plentiful amounts of food when we have guests, and that often happens when we are cooking just for the two of us. There are just certain foods that make amazing left-overs that we can then doctor up and make another meal out of. Which makes our week-day dinners in town tons easier after busy work days. Such was the case last eve with these little baby Yukon Gold potatoes. I had made them on Sunday at WestWard and we had a good amount left over. Here is what I did to make them different from the other meal, so it would not be boring. Oven to the magical 400. A piece of fish and roasted cauliflower was on the menu. The potatoes could heat up in the same oven as those two, as they were already cooked so they were just heating up. You could certainly do this in a microwave, but the oven crisps them up a bit, which I quite like. 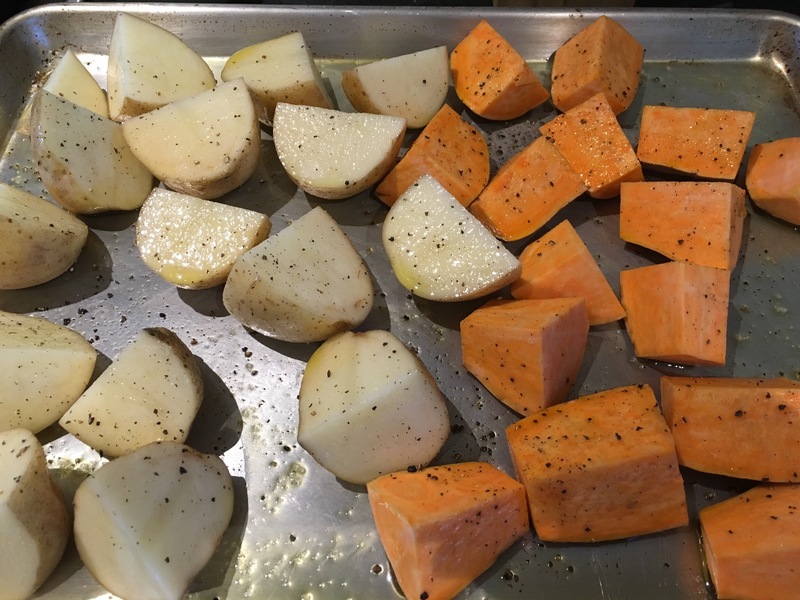 Lay the potatoes out in a single layer in an oven proof dish. Take a fork and press down on each spud until it pops open. A nice full potato laden dish will soon appear. Sprinkle over a little chopped rosemary and a whole lotta fresh cracked black pepper. Put in oven until warmed through. Out of the oven crumble feta to the mix. As easy as that. Would also be amazing with a fried egg set on top. Just saying. But it worked swimmingly nestled up next to the fish and roasted cauliflower. Would work with so many things. Happy Thursday all! How is it May already? A roasted chicken and an assortment of root vegetables was on the menu last night, a recreation of what was on the menu yesterday for the shoot. It looks like I was cooking for a party, but it was just us two. These make great left-overs–reheated for breakfast with eggs, diced smaller and added to salads for lunch, purée into making soups. So I like to make a big batch, plus we love to leave a yummy meal or two in the fridge when we depart for fab caretaker Bill. Truly, could not be simpler. Get the oven heated to 400 while you cut up things. I quarter most and some I leave whole, like the carrots. Liberal use of extra virgin olive oil, salt & pepper over all. Then with clean hands really get into it by moving it all around and make sure every part is covered in oil, as this will help cook and not burn things, and give a tasty caramelized flavor to all. Done. Into that hot oven for half an hour, then turn all, put back in for another 15, check and pull out what is done, and continue cooking until all are to your liking. 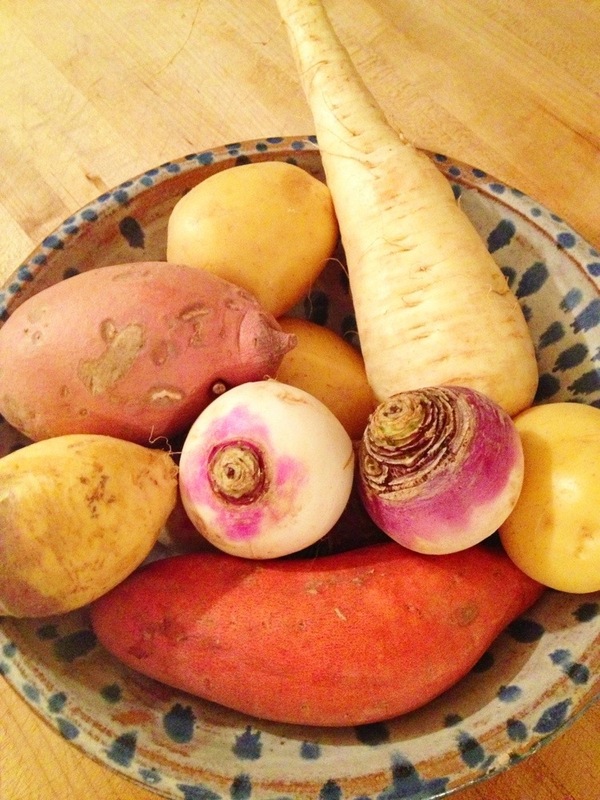 It is that time of year when root vegetables are the star. This is my super, super easy ‘roast them all in one pan’ recipe that I do often in Winter because it is so hearty & satisfying. Last night I plunked a chicken to roast on top of all the below to make it a one pan Sunday supper. 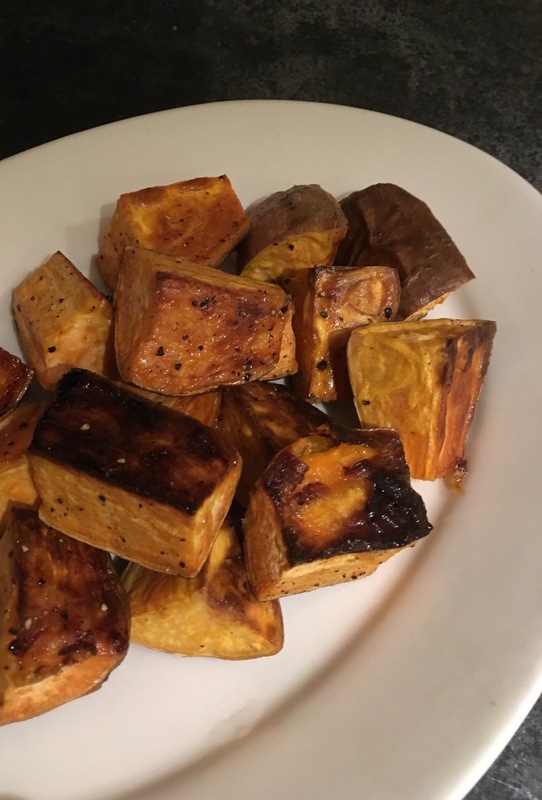 But these roasted root vegetables are also so good served with a piece of fish, a fried egg, or just as they are as a vegetarian option with a salad. Ease is the key with this. I just wipe down the outside of the veg with a damp towel to make sure they are clean. I leave the skin on them all. Here goes. Turn the oven on to 400 while you start chopping. 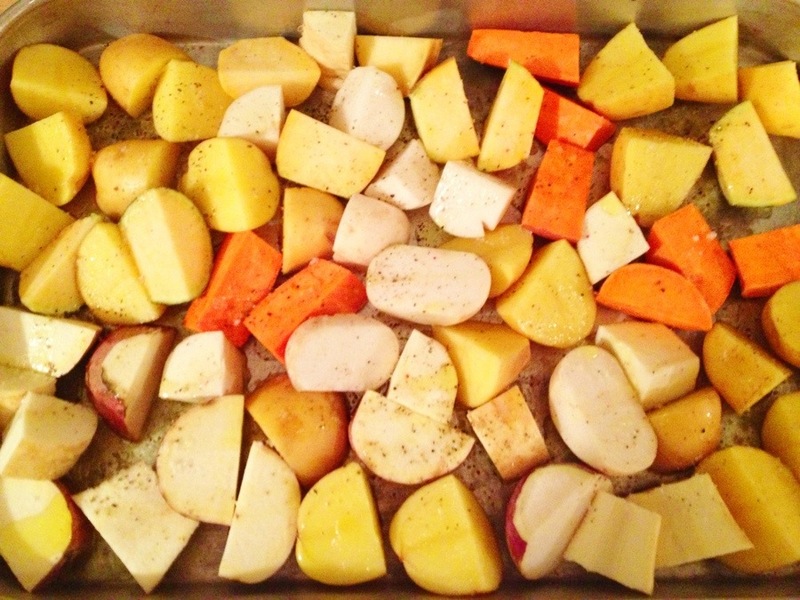 Turnips, rutabaga, parsnips, sweet potatoes, and Yukon gold potatoes are my favorites. Use the ones you like or can find. Cut all the above into similar sized pieces so they cook evenly. I aim for 2 bite sized pieces. Add all to a baking pan. 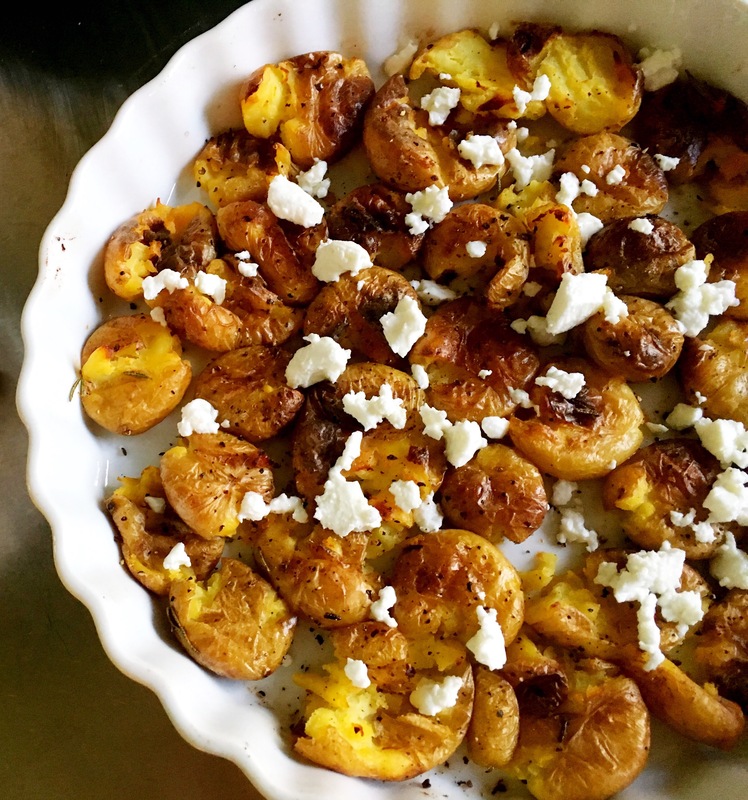 Give a healthy smattering of extra virgin olive oil over the the whole lot. As well as a good amount of salt & pepper. Either with your hands or a big spoon, mix all around to make sure everything is coated with the trio. Put pan into oven. Check every 15 minutes, stirring things around to avoid sticking or burning. At the 45 minute mark check for doneness. An hour is what I always plan on, but it will vary depending on the size of the cut-up veg. Truly, this could not be easier. 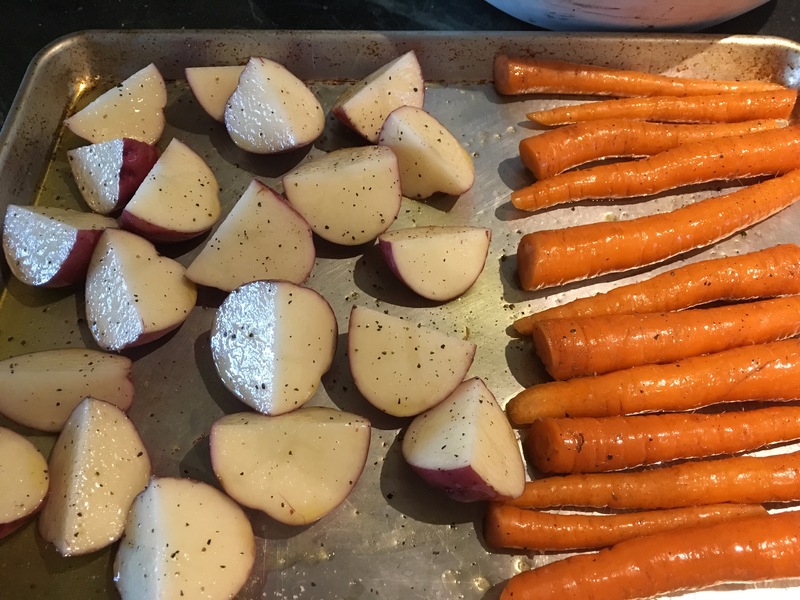 The sweetness and heartiness of the root vegetables make this a go-to time and again during the chilly months. Trying a new dish for me usually ends up as a compilation of several different things I have seen/read, then I put my own spin on it. Roasting potatoes with mustard is one of those things. I saw it on a blog post, saw it in a food magazine, then saw it on a cooking show. This is so easy, and so comforting & tasty. Preheat oven to 400. I know, I cook almost everything at 400. 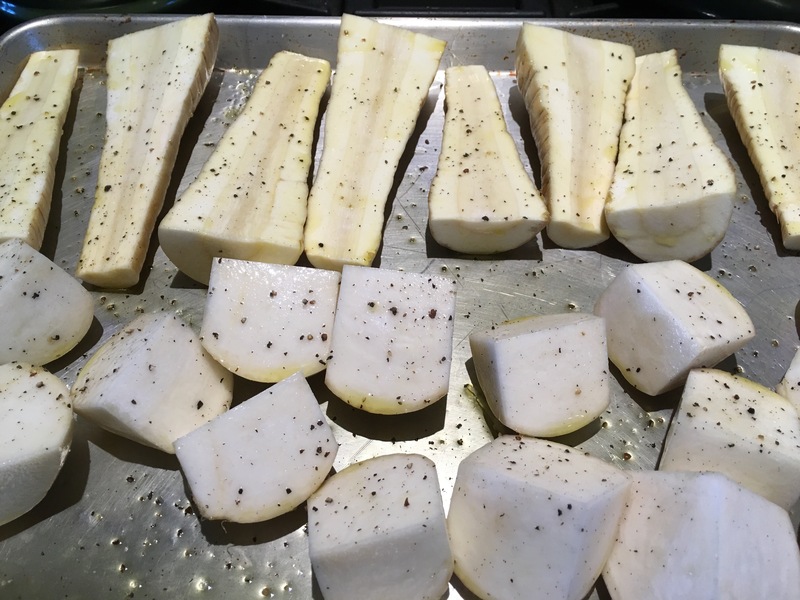 Cut Yukon gold potatoes in pieces that are two bite size. Generally this is quartering them, depending on the size of the spud. You don’t want them super small as they start to break down in the baking/roasting process. 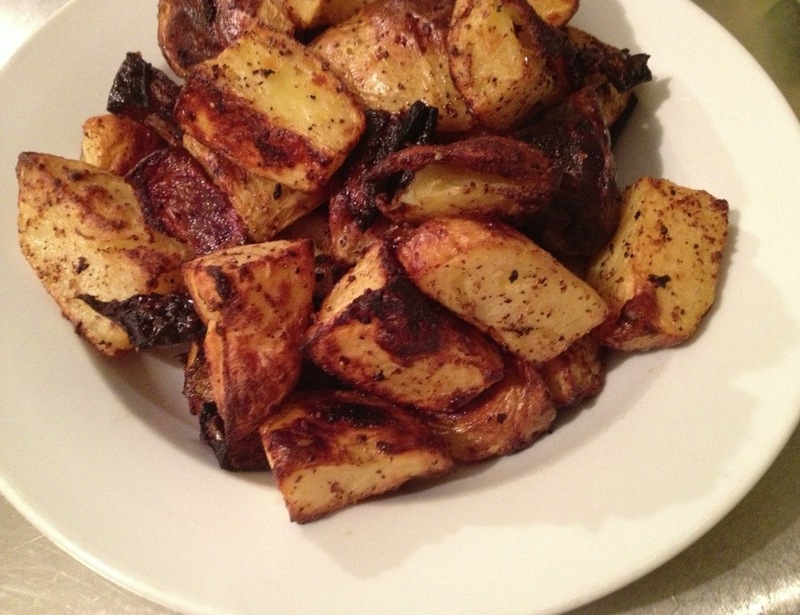 Spread the cut potatoes out into a large oven proof dish or roasting pan. They really need to be a single layer. If they are stacked, they steam more than roast. Then cut up a red onion into large pieces and scatter about. They are such a great combination with the potatoes. Then drizzle all with extra virgin olive oil and a heavy hand with the salt & pepper. Then the magic happens. Spoon over the whole lot several heaping spoonfuls of whole grain mustard. Now with your hands, get into the entire mixture and move it all around until everything is nice and evenly coated with the mustard, including the onions. Wash hands thoroughly, as they will be a mustardy mess. Then put the dish or sheet pan into the hot oven. Check every 15 minutes, turning things with a spatula or a spoon. 45 minutes to an hour should do the trick. Your kitchen will smell divine. Out will come these golden nuggets of deliciousness. They snuggled right up last evening to a piece of halibut, but would work with almost anything. Think steak, chicken. So good. Topped with a fried egg for a breakfast as dinner would be out of this world. The Silver Palate cookbooks are sort of cooking bibles in our household. 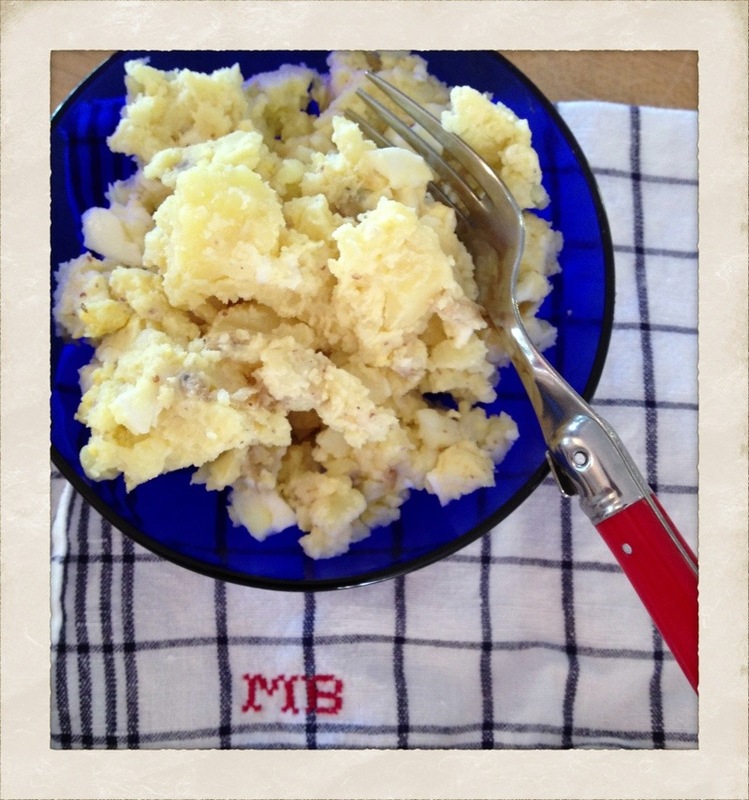 Many an August, I will make a version of their potato salad that is always a potato-y hit. I have altered the recipe over the years but the overall feel/taste is purely Silver Palate. Their recipe calls for a heart stopping 20 hard boiled eggs to the 4 pounds of potatoes. It is just too eggy when I really want the potatoes to shine. 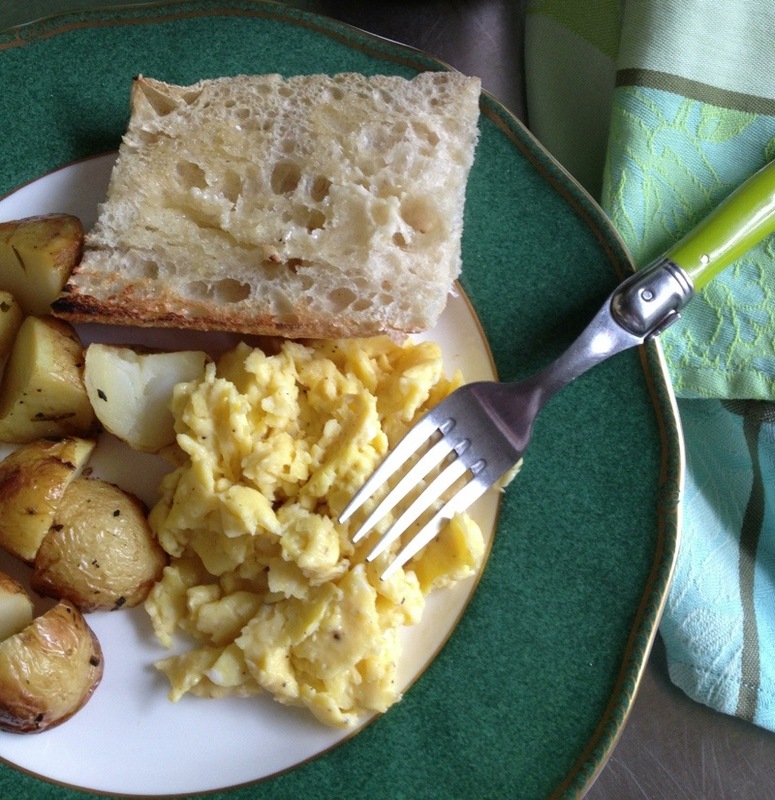 Don’t get me wrong, I adoooore eggs, in every way, but the 2 eggs to a pound of potatoes still does the yummy trick. The vinegar and mustard kick the flavor up considerably. I leave out some other things that it calls for in the book, as well as I don’t peel the potatoes. I like the extra texture & flavor the skin adds. Here is my spin on this classic. 1. Drop the potatoes into a kettle of cold, salted water. Bring to a boil and cook until tender but still firm. 2. When done, drain the potatoes and drop them into a mixing bowl; roughly slice them. Sprinkle the still-hot potatoes with vinegar, olive oil, salt and pepper. 3. Add the mayonnaise and mustard; toss gently to combine. 4. Add eggs and roughly slice and toss again. I like to serve this still warm right after I make it but if you can’t, cool to room temperature, cover and refrigerate overnight. Before serving, toss again, correct seasoning and add more mayonnaise if needed. With fresh herbs so plentiful at this sunny time of year, one of our favorite things to do with them is make herb roasted potatoes. Here is a quick & easy way to make what has become a go-to recipe in our home. Set oven to 400 degrees. 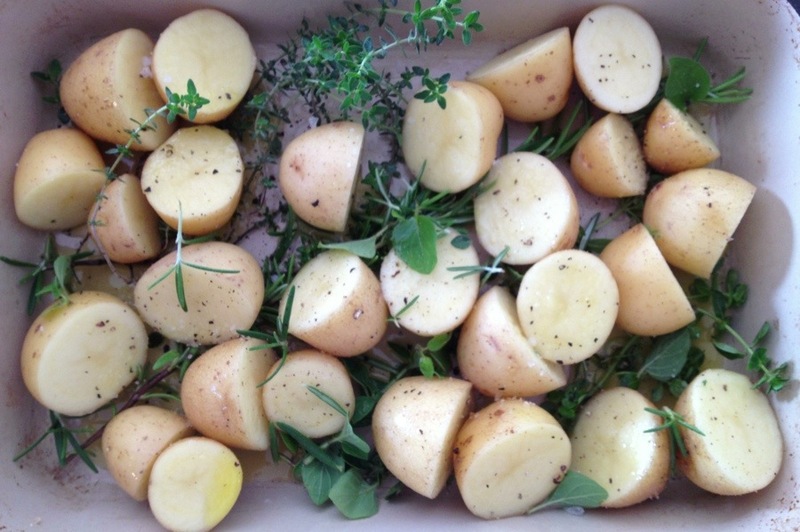 Cut potatoes in half and lay on top of whatever herbs you have or like best, in a baking dish. 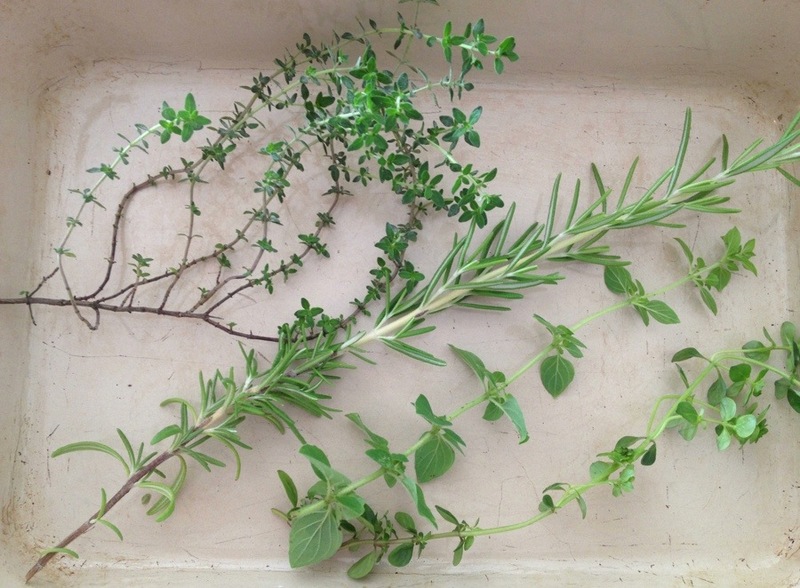 We are fans of thyme, rosemary and oregano. Sprinkle the tops of the potatoes with more herbs, salt, pepper and extra virgin olive oil. Roast in the oven for 45 minutes to an hour. It really all depends on how large the potatoes you use. Shake contents of pan around every 15 minutes so things cook evenly and don’t burn. Your kitchen and your home will begin to smell herbaceous and yummy. These go with just about anything. Friday we had these with steaks done on the grill out on the island. Below was Sunday breakfast with the leftovers reheated in town. I love making extra so we have them for more than one meal.